I was desperate for a cutting garden with something in bloom every day of the summer. I wanted all the colors - purples, yellows, blues, orange, pink, white. I could have all the zinnias and orange cosmos I wanted from Mother's garden. But, at my house, I really wanted perennials that would bloom in waves all season long. One of the flowers I wanted most was orange butterfly weed (Aesclepias tuberosa) - not the annual milkweed, but the perennial one. At the time, it was hard to find in garden centers. I think I ordered it a couple of times, though, and it didn't live. This was back in the early 1980's when I had a little sliver of sun to deal with and made a couple of rectangular raised beds. I had white garden phlox. I had rubrum lilies. There was red monarda (which contracted mildew), a puny pink dahlia I'd ordered through a catalog, some yellow, very invasive evening primrose (no good for cutting) and some weak blue platycodons. I also had some fairly robust 'Becky' daisies (although I didn't know they were called that until later; I got mine through the Farmers and Consumers Market Bulletin, where I suspect 'Becky' came from, too). In the fall, there was the aggressive tall blue ageratum, which came along with the monarda someone gave me. I still find that it pops up in the oddest places. So, as I was driving up U.S. Highway 29 on my way back home, I spotted a huge stand of butterfly weed in full bloom. It was mid June. I thought to myself, "It's okay to dig just one plant. No one will miss it." I took my trusty sharp shooter shovel which I hauled around in my trunk so I could garden at my parents' farm. The ground was hard as a rock, and I was closer than I wished to the railroad tracks. I finally broke the ground all around the plant after a lot of effort. I thought I was making progress as I dug deeper and deeper. But the main root went on and on. What was it going to take to get this plant out of the ground? It was hot, and I knew I was doing something wrong. Someone even honked at me. What I should have done was put the dirt back and hope the plant lived. But no, I was committed. I made a decision that I would go ahead and take the part I had dug. So, I cut the main root off and put the dry plant into a grocery bag. This story does not have a happy ending. I planted the flower right when I got home. My ground was as hard as that on the side of the road. The flower wilted and never recovered. I had stolen a native plant, one that attracts bees and butterflies, and I had killed it. For my 50th birthday, someone gave me a collapsible trowel for the glove compartment. The intent was to have a tool ready when I saw something in the wild to be able to dig it right then and there. But, if my memory serves me well, I never took another plant after my failed attempt at the butterfly weed. I have not participated in any officially sanctioned plant rescues, but I think that is a worthy idea, and I applaud those who save good wildflowers from destruction by a bulldozer. So, the other day, I contented myself by stopping on the side of the road near the farm to take photographs. We used to have butterfly weed in the pastures, but the hay man likely took care of that, I'm sorry to say. I haven't seen any in years. "This plant has an exceptionally long taproot making transplanting very difficult once established. It is recommended that transplanting once established is not attempted as it may kill the plant." Two days ago, I found myself hit with a bout of sadness. On June 17, 1999, fifteen years ago now, my husband died suddenly after playing squash at the Piedmont Driving Club in Atlanta. Usually, I can make the replay of everything that happened go away and substitute more pleasant thoughts. But, this year, I started obsessing about my children. My younger daughter was 15 at the time and just home from boarding school. That means that half of her life has been spent without a daddy. My older daughter was 21 and traveling in Europe with friends, after having graduated from college in May. I don't know which was harder - greeting my daughter as a friend dropped her off after going out to dinner and then holding her in my arms as she collapsed. Or, picturing my child, who had left Italy's Cinque Terre and just arrived in Salzburg, Austria, standing at a pay phone half way around the world and listening to her mother say that her dad had suffered a heart attack and "didn't make it." So, with all these scenes replaying in my head, I called Louise Poer and asked if I could come walk through her garden. She's always so gracious about visitors, and the garden is tour-ready every day, no matter what the season. I grabbed my camera and drove over to her house, which is not very far away. The relief was instant. Whether I was distracted by the interesting new things she had, or if it was the bluebirds flitting away from the feeder as I entered, or the soft ripple of a fountain along the brick path, I don't know. I do know that I am soothed by this garden because it is predominantly green, which has been my favorite color since I was a child. There were a few spots of color here and there - some hardy blue geraniums, some cheerful red blooms on rose standards, and near the entrance, an exquisite bloom on an oakleaf hydrangea that had faded to lovely dusty pink. But the overall garden is a combination of different shades of green, with some variegation mixed in on certain boxwoods, hostas and ivy. The textures, too, are soothing, although a few shapes - like a palm frond - startle you, but in a good way. The rest of the day, I was able to go about my business and think of other things. I usually write something to my girls about the anniversary, but I didn't that day. Yesterday, I e-mailed my older daughter about how deeply I felt about their loss. I received the best reply from her, reminding me that despite all we went through, that other people have had terrible tragedies happen in their lives, as well. She said to concentrate on the fact that things have turned out well for both of them. She also reminded me of all I have to look forward to: a new baby in September and another glorious wedding next May. And, as is always the case, walking through a beautiful garden renews my hope. I came away from Louises's with lots of ideas - more ferns, more intense planting, installing a bird bath with moving water. I admit that as much as I like a mostly green garden, I've been sun-deprived for so long that I still dream of bright summer flowers I can go out and cut to bring in the house. But, I think as far as soothing the soul goes, a quiet green garden goes a long way in chasing the blues and bringing about a certain peaceful feeling. At least it does for me. How can this be the same hydrangea? If you'll put the word "purple" into the white search bar at the top left of this page, the second blog entry that comes up is dated June 8, 2012. You would think the pink hydrangea pictured above would have absolutely nothing to do with the soft grape one from two years ago. Yet, it is the same plant. There's no reason to re-tell the story of how I came to have this hydrangea. It's all there, in long form. In brief, it belonged to my mother and had been at the farm (no telling where she got it or when) for as long as I can remember. It was dug up and brought in a giant container to my house here in Atlanta. Its first June here, it produced lots of medium- to- small blooms of a lovely purplish color - not the deep, rich purple from the farm - but still quite pleasing. The lighter color is what you see in the 2012 post. I left the hydrangea in the container over the winter of 2012-13, trying to figure out where to plant it. Obviously, I should have acted more quickly. Last summer, instead of the grape colored flowers, I was looking at horrible Pepto-Bismol pink blooms. There was no vestige of its former self. In October, when my daughter got married here at the house, the hydrangea had to be moved from its spot in front of the chimney. I didn't watch to see how they did it, but they took it down to the base of the back outside staircase. I had another very large hydrangea rooted for me by my friend Jane Kyburz. She had brought over a bouquet a few years back with a light pink hydrangea in it. I asked her to layer one for me, and she did. I bought a huge fake terra cotta container for it, and the plant has grown into a lovely giant. The two hydrangeas were sitting side by side. Then winter came with the threat of a five degree freeze. I had the pots moved under the concrete deck. I didn't cover them, but they were pretty well protected. So, I was ecstatic to see the little broccoli flowers coming out on the stems in spring. I had hardly any dead wood on either plant. One day a few weeks ago, one of the men from the farm brought me a boxwood to go near the new arch garden. He suggested I plant Mother's hydrangea there beside it, so it was dragged back up the hill. I was so anxious to see how the flowers would turn out, even though not much time had passed since it was put in the ground. I was disappointed. While it's a deeper hue than the Pepto-Bismol, there's still no trace of its former color. So, I guess I will have to see what next year brings. It could be that the acid in the soil will change the color back to purple. I'm hoping that will happen. I need to consult Elizabeth Dean of Wilkerson Mill Gardens and Hydrangea.com, who says the hydrangea is probably 'Merritt's Supreme.' I'm thinking this started out as a potted plant with colored foil around it. Maybe not. I wish I'd asked Mother where she got it. For the time being, I must admit that as you come down the driveway, the rosy color does look rather pretty. But the one I'm excited about is Jane's hydrangea. 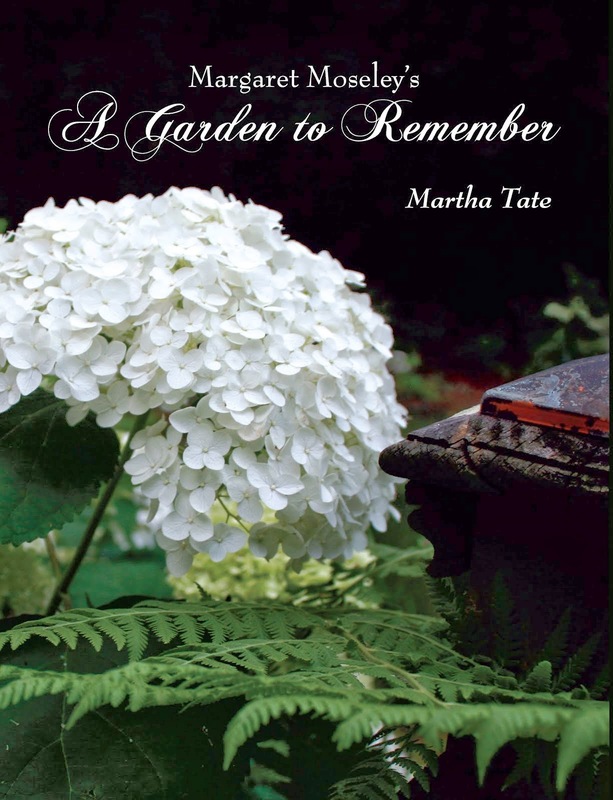 For years, I had admired a photograph of a light pink hydrangea in a book I have on French gardens. Coincidentally enough, the French flower is in a container at the base of a staircase on the outside of the manor house belonging to Robert Mallet's family in Normandy. My children and I visited Robert in 2006, and that big container was still there. So now, I, too have a large container with a light pink hydrangea sitting at the base of a (very plain) staircase. I had contemplated putting some lime on it last winter, but I chickened out, afraid I'd hurt it. For the foreseeable future, it will stay in its container, and I'll try layering it to produce two more plants (still copying Robert; in another book there is a photograph taken in fall of two light pink hydrangeas in containers at the Bois des Moutiers; now all I have to do is build a stone colonnade; that may take some doing). Back to Mother's hydrangea. I'll have to think about doctoring the plant, or I may just wait and see what happens and then take action later. One never knows with hydrangeas. The late Penny McHenry, founder of the American Hydrangea Society, would always say that when it comes to color, hydrangeas would make a fool out of you every time. I think she was right.